You've worked long and hard on a beautiful garment. What worse nightmare than to discover that it's been damaged? Not to mention any names, but I know a couple of cats that enjoy playing with wool, and a few dogs that like chewing on soft things. This article outlines techniques for common repairs to knitwear. Several things can happen, which require different types of fixes: seams coming undone, pulls, tears and holes. There's a few things a knitter can do when creating the garment to make future repairs easier. Several wise knitters have recommended sewing some spare yarn into the seams of the garment so that it gets washed and worn in the same way as the garment itself, ensuring less visible repairs. In my inevitable rush to finish and wear whatever I'm working on, I rarely manage this. I'm also skeptical about my own ability to remember where I sewed the extra yarn in, and to extract it neatly. Another solution is to attach the bobbin of spare yarn to the garment when you launder it. I'm of the mind, however, that this is rather like making your own stock for soup, or freezing the home-made pesto you put together in August to use up all that extra basil from your garden... an excellent idea, but not something most of us have the forethought or inclination to do. Check the ball band, and choose a yarn as similar in composition and weight as possible, so it looks the same, and behaves the same way under wear. That is, don't mend a superwash wool sweater with a non-washable wool. Needlepoint yarn comes in a very broad variety of colors, and can be used in a pinch. Use multiple threads to match a heavier yarn. This is best for areas not very visible. You can retrieve yarn for repairs from the garment itself. If it has a turned-in hem or waistband, unravel a row or two and replace the yarn with something else, or just re-sew it into place. If you've got extra length in the garment or the sleeves, you can cut a row or two above the ribbing or border, take a few rows out of the main body, and graft the border back onto the main section. All of these techniques require you to sit under a strong light, with your bag of knitter's tools at your side: crochet hooks of various sizes, safety pins and darning (a.k.a yarn) needles. And after any repair, a good blocking or laundering can help tidy things up. Assume that wherever a verb appears in the text, the word "carefully" belongs beside it. This is surgeon's work. Generally the easiest to fix. If you made the garment yourself, you should have a good idea of how it was put together. Examine the seams in the garment carefully to get a sense of how they were sewn. 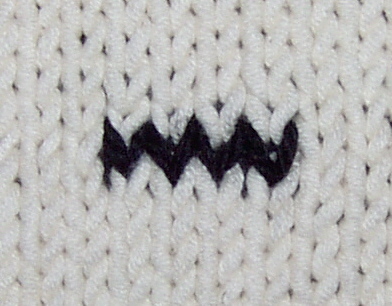 If the seam was created with mattress stitch or another invisible seaming technique, this can be an opportunity to retrieve some of the original yarn for use in later repairs. Another relatively benign form of damage in a knit fabric, a pull is when a strand of the yarn has caught on something, pulled out and distorted the fabric -- but is not actually broken. Tug gently at the piece in all directions, and examine it closely to identify where the pulled yarn comes from. 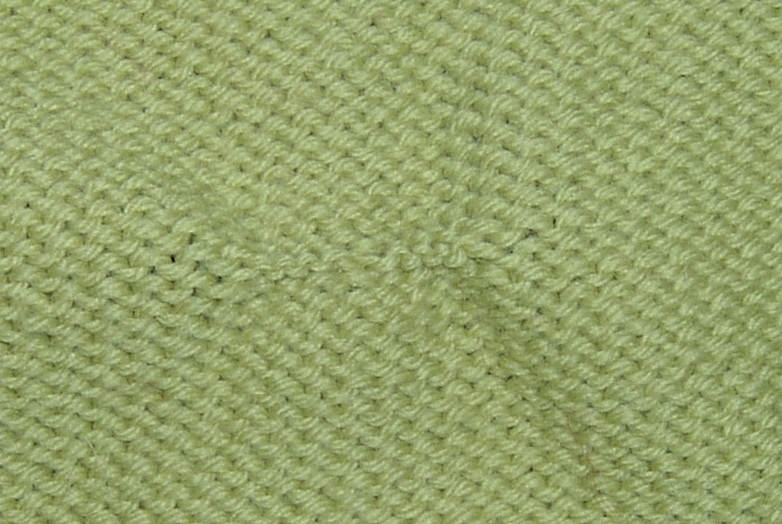 A pull causes the stitches in a row to contract. This is easily spotted on the wrong side of stockinette stitch, as two rows of garter bumps are tightly compressed together. Working on the wrong side and starting with the stitches closest to the pull, use a crochet hook to distribute the yarn back through the "squished" stitches. You may need to go over the row a few times until you get the tension of the stitches right. If the yarn has broken, deal with the pull first, and then repair the resulting hole. I highly recommend practicing on a swatch before you start working on the actual garment. 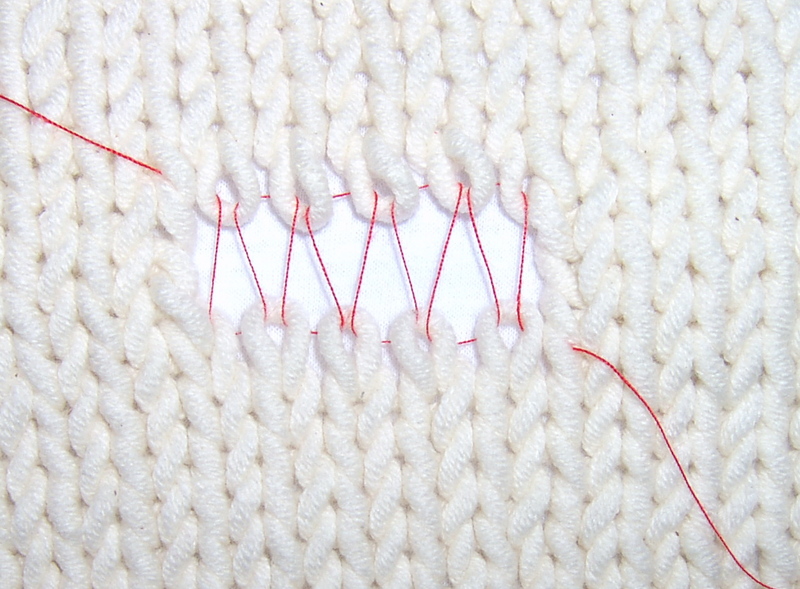 Examine the hole carefully, and unravel it just enough to get a clear view of stitches that are now "open". Pin the piece you're repairing to a stable surface, and tuck the yarn ends underneath and out of the way. If the hole is only one row deep, a simple graft should do the job. 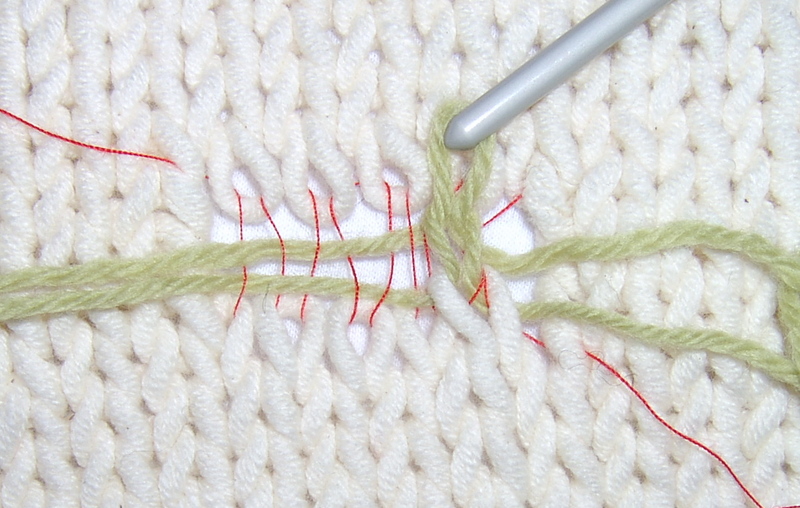 Remember that the trick is in the alignment of the stitches. It's straightforward, as long as you get the stitches lined up correctly. See pictures and your favorite reference book for more details. 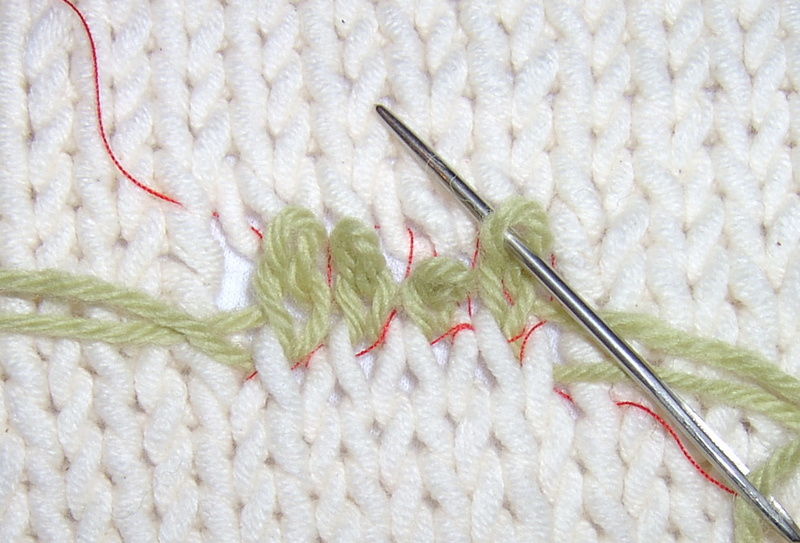 Use the ends of the grafting yarn to close up the opening on either side of the repair. Weave in the ends of the broken garment yarn, too. If the hole is deeper than a single row, it's a two-step job. 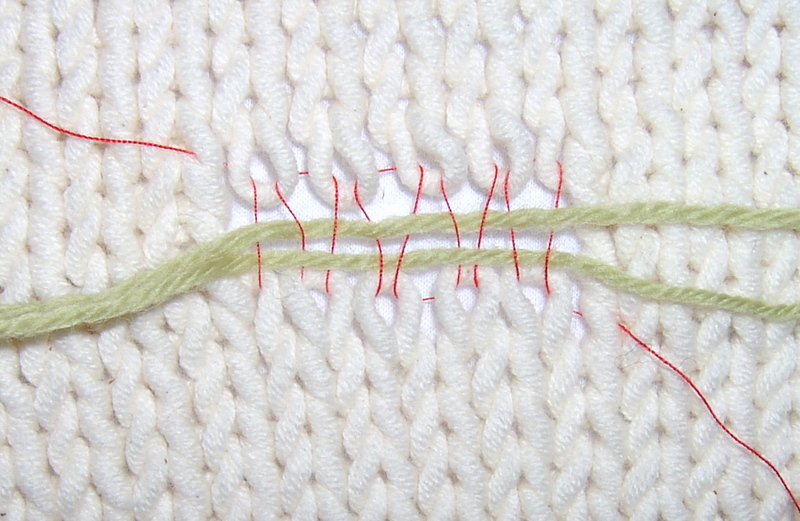 To anchor the stitches and for a guide, loosely graft the stitches at the top and bottom of the hole together with a contrasting color sewing thread. You then need as many lengths of yarn as there are rows to be repaired -- each should be at least 3 inches/8cm longer than the gap you're filling. You're going to rebuild the stitches using those lengths of yarn -- one for each row. Thread the first length of repair yarn onto your darning needle, and weave it through the stabilizing thread, under and over a whole stitch each time Æ that is, under two threads at a time. Repeat this for each row but the last, alternating the weaves. That is, on the first row, the repair yarn will be run under the first stitch, on the second row, the repair yarn should run over, and so forth. You'll then be able to take the crochet hook and chain stitch each column of stitches up to the top. 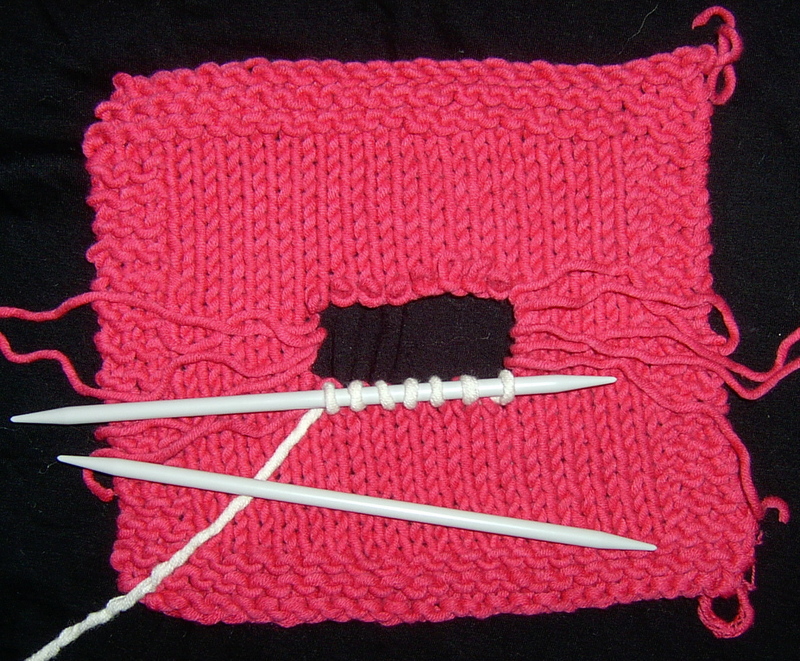 Keep the crochet hook above and to the left of the anchor thread. Once you've done that for all stitches, graft the final row closed with the last length of yarn. Working from the wrong side, remove the anchoring thread. This is a little simpler to do, but the mend covers a larger area, and is therefore more visible. It does have the side effect of reinforcing the area around the hole, which is of benefit if this is something like a sock that's got a hole due to wear, rather than a rip or a moth hole. Don't do any unraveling; you want as much of the existing fabric in place as possible. 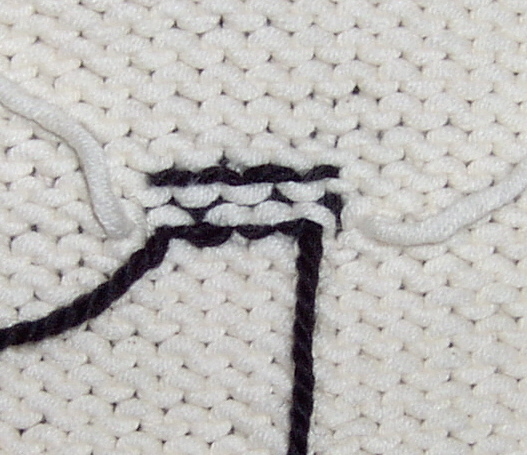 Again, use sewing thread to anchor the open stitches. 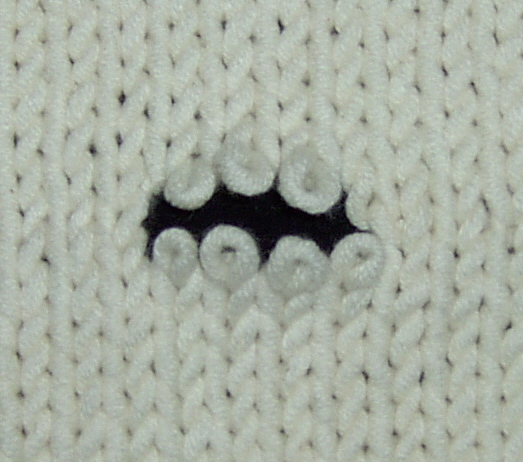 The idea is to duplicate stitch over the region surrounding the hole -- a couple of rows above and below, and a couple of stitches either side -- and over the hole itself. 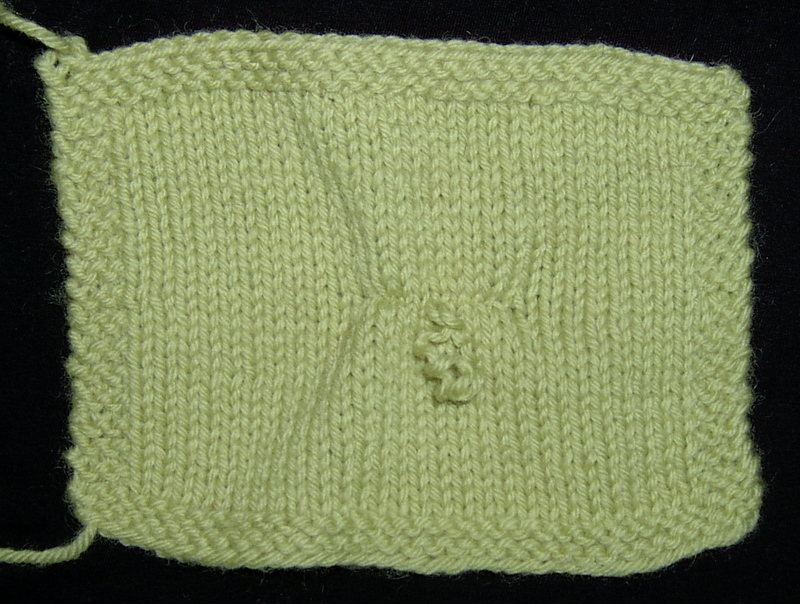 The "shards" of yarn and knit fabric provide a good guideline for the stitches. See any of your favorite knitting reference books for instructions on duplicate stitch. Again, when you're done, remove the anchoring thread. Preventative maintenance is helpful. 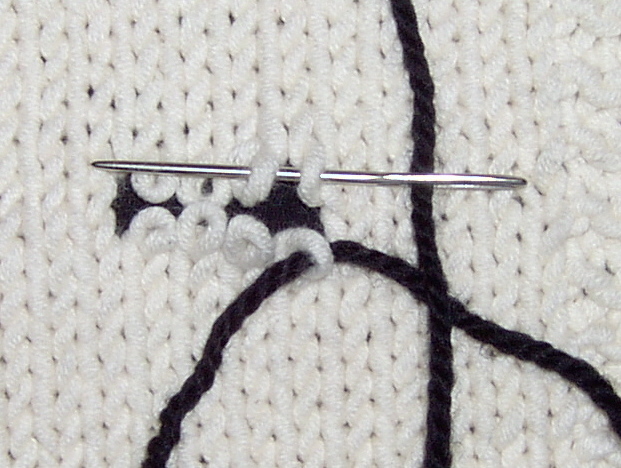 If an area of the sock is wearing thin but doesn't yet have holes, duplicate stitch over the area to reinforce it. Use a specific sock yarn for its resilience. Since sock yarns are of similar weights, and the area being reinforced is typically hidden in your shoe, it's not such a problem if you can't get a precise match with the reinforcing yarn. Even if the sock is knit from heavier or non-sock yarn, use sock yarn doubled or tripled for the reinforcement, to prolong wear. To close it up, graft the last row to the open stitches at the top of the hole, and seam the sides of the patch to the sides of the hole. If you're designing your own socks, you may want to investigate the "afterthought heel", which, by virtue of its construction, can be removed when it wears out and replaced. See Jill L. Schaefer's lesson from the Socknitters list. If the damaged area is too visible or too large to mend; if you can't find a matching yarn, or if your skills just aren't up to the repair, there are other techniques to disguise the damage. It may not be quite the same as it was before, but it's better than throwing it away. These techniques also work for covering up stains. For damage on the body of a sweater, mend the area as well as you can and then apply a patch or pocket over it. Damaged cuffs or ribbing can be entirely removed and replaced. Undo any seams, and carefully cut a row or two above the ribbing. Pick up the live stitches and work a new ribbing or cuff. You can reuse as much yarn as salvageable and simply have a smaller border, or use a different yarn entirely; after all, it's not unusual to see a garment with borders in a different yarn. Fur cuffs and collars are enormously fashionable at the moment, so consider applying a novelty yarn to both the cuffs and the collar of the garment, either covering up a repair, or entirely replacing a damaged area. In the same vein, cover up damaged ribbing or borders with ribbon or fabric. More radical surgery is also possible -- shortening the body or the sleeves of the garment, cutting a pullover into a cardigan, and so forth. And of course you could always felt the damaged garment and make it into a pillow or bag. The self-published Flawless Knit Repair, by Rena Crockett, is an absolute marvel. It provides, with painstakingly detailed diagrams, clear instructions for unraveling and reworking knits using the weaving method. Order from your favorite online knitting book specialist. Kate knits and lives in Toronto.